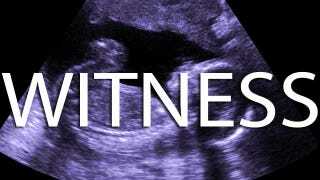 A fetus is scheduled to "speak" before the legislature in support of the so-called "Heartbeat Bill" to ban abortions as early as 18 days after conception, or as soon as a heartbeat can be detected. According to the AP, a pregnant woman will go before the committee beside a color projection of her ultrasound. No word if she's allowed to talk too, or whether someone will provide ventriloquist-style commentary on the fetus's behalf. Detection of a heartbeat can range, so Faith2Action is skipping the embryonic stage and going with a fetus nine weeks into development. According to their own materials, this is "discrimination against the young." Just check out the YouTube video they made in support of the bill. According to the commercial, the plan is to inundate state reps with heart-shaped balloons. "Have a heart, don't let them kill / Help us pass the heartbeat bill" is sung to the tune of "99 Red Balloons." The ad also openly discusses the strategy to get to the Supreme Court and dismisses the concerns of other anti-abortion activists — including Ohio Right To Life — that such a case would potentially affirm rather than overturn Roe v. Wade. As constitutional law professor Laurence Tribe has put it, "What they're doing is trying to push the point at which the woman's rights are subordinated to those of the unborn to a much earlier point in pregnancy. ... It's clearly a frontal challenge to Roe v. Wade."